1. This machine is the second generation of AB-C1. 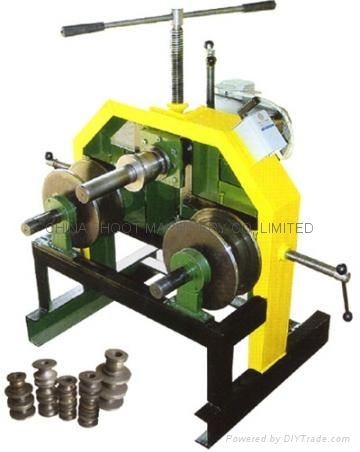 Compared with AB-C1, the space length of the two driving shafts of the machines is adjustable; thereafter we can bend various diameters round pipe, square pipe, as well as large and small diameter arc and round products. Owing to the adjustable transverse distance of the two shafts, it can bend large pipe easily. 2. In operation, we can get arc and round parts with different diameter by controlling the press-down sizes of the driven roller. 3. It can also bend square pipe, round pipe, stainless pipe and flat iron. The dies is complete. There are 18 kinds for choice. 60×60mm, 70×70mm. They also can bend rectangular pipe. 1 set for bending flat iron. φ16mm, φ19mm, φ22mm, φ24mm, φ30mm, φ36mm, φ50mm, φ63mm, and φ76mm. It is ＄270 for all 9 kinds. 9 kinds,it’s ＄35 each one.